Casas de Pedra - Enjoy a rural atmosphere with all the facilities of a hotel. At Casas de Pedra you can enjoy a rural atmosphere with all the facilities of a hotel. In your stay you can enjoy services included as breakfast, daily cleaning of your house, towels and all necessary linens, laundry, air conditioned, food for your dogs, firewood included for your fireplace, among others. Our houses have a license of Agroturism, so if you love flowers and nature this experience it's perfect for you! Activities in the garden are also included in the stay. The Casa de Pedra is a cottage, beautifully restored from an old stable or hayloft. which has retained much of its original structure and tha basalt stone with which it was originally constructed.It stands in the grounds of the main house, belonging to a Madeiran family, traditionally doctors, who live there all year round. Flat screen Tv,( cable TV), Air conditioning, Kitchenette equipped with stove, oven, microwave, electric kettle, fridge and toaster, wand magic, Nespresso coffee machine and all material needed for making light meals and cleaning everyday. Tea, coffee, chocolate, milk, juice, water, cookies, toast, butter, jam, cheese and fruit variety. It is the ideal place for who want a quiet holiday and where you will find the tranquility necessary for rest physical and intellectual. The houses have an inviting outdoor patio for meals or as a solarium or simply listen to the silence or watch the stars in the beautiful night skies, only possible living away from the cities.This space is equipped with dining table with 2 chairs, as well as 2 sun beds. Customers may also use a small gym without any extra money. It’s also disposal a barbecue properly equipped with all the necessary equipment for making grilled meals. Dayling cleaning is included as all products required for breakfast as well. It’s also a courtesy to pick up the guets at the airport, even if they have rented car, because not only personalizes the attendance but also facilitates access to the destination. 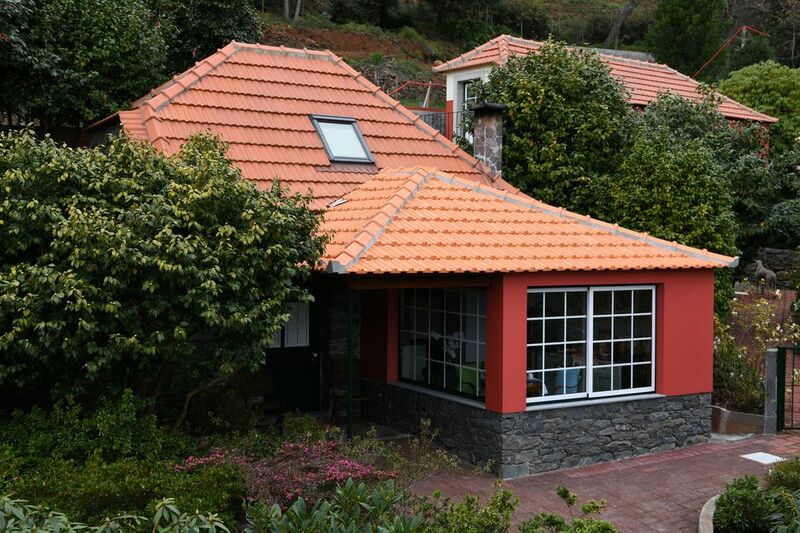 The rural and romantic Casa de Pedra can be found in Camacha 9 miles from Funchal and 10miles from the airport. Walks & Levadas: The best way to reach the interior of the island of Madeira and enjoy the splendour of its untamed landscape is to follow the footpaths. Levadas are water courses running round the mountains and were built by the first settlers to carry water to inaccessible farmland. Today they are one of Madeira’s greatest tourist attractions. Attractions: Madeirahas a number of attractions worth visiting during your holiday. The best-known and most traditional is the descent from Monte to Funchal in a wickerwork sledge. There is a variety of other attractions in other areas of interest that will help you learn more about Madeira while thoroughly enjoying your free time there. Tours: This is a fascinating landscape, with its high mountains and deep valleys covered by exotic vegetation and colourful flowers. Add to these attractions the charm of the small villages and the cosmopolitan rhythm of the capital, Madeira, and you have plenty of good reasons to set off and explore every corner of the island.The Transport system is top quality and varied. So choosing exactly how you will explore the island is up to you! These buildings are integrated in the same area as the main house, and are owned by traditional Madeira Medical doctors who reside there through the year. This area is surrounding by a large and beautiful garden with 5000 m2, full of exotic plants from temperate climates. During the winter season and Spring camellias, magnolias and azaleas are blooming. In April/May rhododendrons are at their maximum splendor. Situated in a quiet location, with the surrounding beauty of the trees of the forest, Laurisilva of Madeira an indigenous forest, classified as World Natural Heritage, decreed by UNESCO, is the ideal place to enjoy some hiking on foot along the levadas or simply enjoy the fresh country air. Kitchenette equipped with stove, oven, microwave, electric kettle, fridge and toaster, wand magic, Nespresso coffee machine and all material needed for making light meals. outdoor patio for meals or as a solarium or simply listen to the silence or watch the stars in the beautiful night skies, only possible living away from the cities. 2 golf courses, 5km and 15km away. Filomena is a generous host who provides her guests with delicious breakfast ingredients. The cottage is very comfortable and well maintained. Wonderful! The hospitality was second to none! The hosts were so attentive and treated us with the perfect amount of care! We would highly recommend this place!! We love staying at Filomena's Stone houses. Filomena is a great host, receive us with great warm and sympathy. The house is beautiful and surroundings amazing. Is perfect for a weekend gateway or if you can stay, enjoy a couple of days emerged in the lovely Madeira Nature. To those who appreciate, the bed is fabulous. Super comfortable. Filomena's Courtesy provide us basic food supplies, which is great if you don't feel to go out to diner. I absolute recommend, Stone Houses and we will try to came back to enjoy a longer stay. Thank you for everything Filomena. Is very important for us the feedback from our guets. We will improve better and better to creative a really paradise!!! We really enjoyed our time here. The cottage is beautiful & immaculately kept. The little touches like flowers and the fresh bread were lovely & really appreciated. Thank you. We will certainly recommend this property. Your comments is very special for us and an impluse to do better and better. We hope to have you with us next future. It was a cosy cottage in a beautifel garden near Camacha. We couldn't think about something what was wrong! Everything was ok! we Will do our best To to our guests. The discussions we had from the first minute were very rich, deep and "profound" about aspects of life on Madeira and life in general. Filomena introduced us to the owner of the most famous madeiran embroideries producer Bordal, and when we arrived there we were immediately welcomed there by Susana herself and treated and advised like old returning customers. Simply amazing. Saying this not as a set phrase, but because we were - amazed - indeed. Pedro also gave us valuable advise on best places to eat, pointing us exactly into the direction of the kind of restaurants we were looking for. Our last dinner at Abrigo do Pastor, on the heights over Camacho, just hours before our departure plane, remains epic in our minds. The cottage in itself, as some reviewers mentioned, feels more spacious than the pictures suggest. The interior design is perfectly arranged, hence everything you might need (and wouldn't imagine in such a presumably tiny place) is there without it all getting crowded. From a practical point of view, there is a brand new and pretty large new shopping complex just literally two minutes drive away, allowing rural feeling with all amenities close by. Funchal city centre is just about 20 min away, making a night out very practical. 20 minutes drive to the airport over the rapid carrigeway. The most used hiking book used on the island is the ROTHER GUIDE. the Walk nr 9 (2012 edition), along the LEVADA DA SERRA literally passes by behind the house. The stone house is situated in a very beautiful garden with a lot of different Camelias that are superb when blooming specialy in winter. Guest have their one garden but can also visit the main garden. Is a very quite place just the sound of the birds one can listen. • Now you are in the road, Caminho da Ribeira Grande, drive about 300 meters and on your right is the house. Golf: The mild climate on the two islands is ideal for golf all year round. This, together with the exceptionally beautiful scenery, influenced the decision to build two golf courses in Madeira. There is no taxes or additional charges Payment after check in, cash Is a very safety place Accommodation for two people .